Pohang has long been a city I've heard plenty about but, admittedly, had no major interest in. There's quite a few industrial cities in the Gyeongsangdo Provinces which I've been to in the past, and I had thought Pohang would be something more or less along the same line. Pohang has an interesting history behind it being the "home base" of sorts for Korea's major steel corporation, POSCO, which rode on Korea's rapid development and modernization post war. 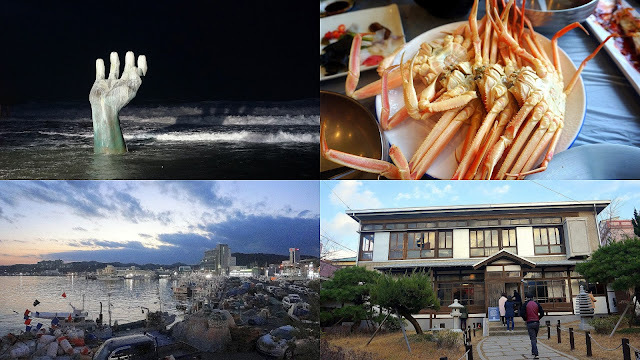 A family event brought me down to Pohang with not much exception but I ended up quite pleasantly surprised by what this coastal city had to offer. Having driven down from Seoul on a late afternoon, I arrived quite late in the evening but thought it would be nice to stop by the famed Homitgol. As one of the most easternmost point on the Korean peninsula it's particularly popular for watching the sun rise, especially on New Years. Also found here is the Hands of Harmony statue, a giant statue of a hand that juts out in the sea towards the skies and a favorite subject for photographers (though most do so during sunrise). Though the statue is arguably one of the most well-known statues in Korea, less know is the fact that the piece is comprised of actually two hands. The right hand that stretches out from the sea is the best known and most photographed but a few meters away, on land, the left arm also stretches out towards the heavens. Jukdo market is a traditional market that's well known for its seafood. As a coastal city, the seafood offerings are fresh and generally cheaper than Seoul. It was rather late so most of the market stalls were closing up but some fried fish cakes (uhmook or "hot bar") were a great snack for the chilly evening. You can get them rolled up in various fillings such as ham, perilla leaves, imitation crab, etc. As many of the coastal markets in this region, traditionally Koreans here do actually capture and consume whale meat. Most usually mink whale. Outside of any ethical reasons I'm not a fan of it anyways but you can see many stalls selling them right there on the spot. But what I was there for were the crabs. Pohang is well known for their red crabs in the colder seasons and there were many stalls offering these prized beauties. Prices depend on the size generally. As with all such traditional seafood markets you should visit a few shops to see prices (though they will generally be more or less the same) and you could try and negotiate some deals. In general, they're more open to adding on some freebies than cutting down on prices (it helps if you mention you'll pay by cash) but who knows, try your luck! The menu of the restaurant we settled on. With your crabs selected and steaming in the kitchen, you're first brought out an array of appetizers including grilled mackerel, abalone, mussels soup, squid, tempura, etc. While the appetizer offerings are similar to most seafood joints in Korea, one notable unique offering is the dish of gwamegi. A local delicacy that's especially associated with the Pohang region (they even have an annual gwamegi festival), the dish consists of herring or saury fish that is hung outside in winter time to air dry in a repetitive freeze/unfreeze process. What's left is a chewy, fish jerky kind of texture. The favorite method to eat it is to wrap it in some sort of ssam though the vehicle may be dried laver, fresh kelp, lettuce, etc (depending on the person) and added with toppings like leek, onion, garlic and the spicy sweet cho gochujang. The oily fish delicacy will probably not win over most folks right away but spend enough time with it and you may find yourself thinking about it time to time. I mean, I know people who travel specifically down to Pohang in winter time just to get this dish. In this restaurant, the mulhwoe and its broth came separate. In the first bowl was the vegetables piled high with fish and other seafood goodness, toasted seaweed, sesame seeds, etc. The chilled spicy sweet broth was provided on the side with a big old ladle for one to add and adjust to one's preference. Quite generous with the seafood. Despite how fiery red it looked, it wasn't as spicy as it seemed and there was quite a good balance of savory, sweet, nutty flavors to not drown out the ingredients. And finally the big ol' crabs. Growing up in the west coast in the states, my family used to occasionally go out crabbing seasonally. I've found that variety of crabs in Korea seem to have a more delicate and mildly sweeter flavor that makes them particularly delicious when they're in season. On the other hand, I wasn't at all a big seafood fan when I was a kid so maybe that's just my imagination. Though we had opted for some middle-sized guys, they were still chock full of meat. As Pohang's crab is well known and well lauded in the peninsula, these crab restaurants know how to cook the crabs to a perfect point. They're also experts at teaching you where to snip to get the crab meat out intact. With the crab, you can opt to take its innards to make a nice bibimbap. Those who know, know this is some good stuff. With bellies filled, we took a walk along the harbor to catch POSCO in its full colorful display. As I mentioned, POSCO is a huge steel factory that makes up a good percentage of the city's economy and their immense facility lights up every night for a pretty little sight. The illuminated city with the lights reflecting off both the harbor and the Hyeongsan River really does a wonder in bringing out the sentimental romantic in one's self. I wasn't expecting it but you are quite a pretty one, Pohang. I was in Pohang for a family event so the next day my aunt had treated us all to a nice lunch. I can't tell you the name of the restaurant but such seafood course restaurants are prevalent in this coastal city with a wide range of seafood delights. Crab of course. Can't leave out the crab. Because my Pohang trip was only a short 2 day-er I was already beginning to get bummed out I couldn't see more when one last area caught my attention. Just along the coastal line of Guryongpo lies what is now being called the Geundae Culture Street (근대 문화 거리). Such "culture streets", as they are always called, are found in just about any tourist-heavy city these days but what the name disguises is the fact that this is, more or less, what was the residential area for the Japanese population many decades ago (a "Japanese" town of sorts for Pohang). During Korea's colonized period, some 50+ Japanese families came and established a community here to make use of the fishing licenses they could obtain for the mackerel and other seafood goodness off the shores here. A nicely summarized explanation of the area can be found here but nevertheless, the area's preservation and (somewhat controversial) restorations has led it to give a (mostly) authentic replica and feel of a Japanese village from this era. Now, many of these structures have been converted into shops, restaurants, tea cafes, and kimono rental shops and attracting curious visitors looking to get a glimpse of this era. Particularly not to be missed is the Guryongpo Modern History Museum which is housed inside a former Japanese home and offering a realistic look at how the Japanese families of this era lived. It's as beautiful outside as it is inside and should not be missed. Of course as in many parts of Asia, any association with the Japanese colonial era brings about a heated, emotional response (and partly justly so) from the older generation and this area in itself was, and even currently is, not without controversy. The area itself was hotly contested between local groups who advocated either razing the entire neighborhood because of its links and those who advocated preserving it. Such a polar disparity is perhaps most reflected in the former Shinto shrine and its pathway that used to be found on the hill in the center of this neighborhood. Though it's now known as the Guryongpo Park, this hill used to hold the Yongwangdang Shinto shrine the local Japanese community would go to to pray. The staircase leading to the shrine was flanked on both sides by tablets with the names of prominent local Japanese residents who had aided in Guryongpo's development. Post-WWII, after these families had returned back to their native Japan, the local Koreans not only cemented over these pillars but turned them upside down. The shrine itself was eventually razed a few years ago on the basis of structural unsoundness and replaced with a hanok but based on the emotional connections this neighborhood has, who knows the real reason. The pain and scars of the past here are quite evidently still healing. One can rent a kimono to wear around the area for pictures but I think also not to be missed are the number of coffee and tea shops in the area. As they are housed within these former homes, the truly Japanese exterior and interior gives one a feeling that they are sipping tea in a village in Japan somewhere. Complete with tatami mats, screen doors, floor seating. Offering drip coffee, Korean, and Japanese teas and desserts, the prices are also quite reasonable as well. This place even offered little biscuits along with the strong, drip coffee. I can't remember which tea I got but I remember enjoying it. Kudos for being served by the pot as well. A cozy, snug, Japanese-esque tea time in Pohang. It was gwamegi season so in many places you could see the fishes being air dried for this delicacy. Surprisingly they didn't smell as strong as I thought. And spoiled for choice in crab restaurants. I came to Pohang not really expecting anything and initially thinking 1.5 days would be more than enough. But over my short time there I was genuinely and pleasantly surprised in what the city had to offer and its unique merits from other cities. Combining industrial prowess, coastal beauty, history, and plenty of good food, Pohang became one of my favorite cities in Korea. I'll be back to get to know you better, Pohang.